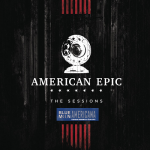 Our playlist today sets its sights on the American Epic Sessions as we bring you tracks from this joyful selection of contemporary artists covering tracks from the early days of recording…using an early day recording device. Jack White and T-Bone Burnett deliver something very special in this release. We’ll feature the Alabama Shakes, Rhiannon Giddens, Pokey LaFarge, and The Avett Brothers covering the songs of Memphis Minnie, Victoria Spivey, and gospel classics also covered by Willie Nelson and Patsy Cline. It’s a very special Blue Moon Americana celebration this week.